With roller derby season gearing up again, the teams are entering an intense time. For many of the skaters, derby is an overwhelming part of life, something they have to balance with work and their non-derby-season commitments. There are weekly practices, weight training, event planning and bouts. This season, there will be a total of four bouts. The headliner bout of the 2014 Golden Bowl, held at the fabulous ocean-side Craneway Pavilion on Sunday, June 15 was also referred to as the battle of the gold helmets or the battle for the Golden State. The Bay Area Derby Girls (#2) and the Angel City Derby Girls (#6) are both California teams and not surprisingly, they both wear gold helmets. To have two California teams so high in worldwide WFTDA rankings, and to have them both in the same building playing against each other is a rare treat for skaters and spectators alike. Miss Moxxxie and Kimfectious from Bay Area Derby Girls join Maureen to talk about Roller Derby and their upcoming matches at the Craneway Pavillion in Richmond on Saturday June 15th. BERKELEY — Weekdays at UC Berkeley, Erin Fenley is all about helping the campus reduce its carbon footprint by saving kilowatts. 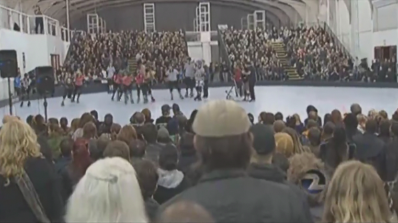 After hours, she’s all about burning energy – her own – in an intense roller derby scrimmage. To understand the former Fenley, it helps to appreciate her roots. Berkeley’s energy-management communication specialist grew up in southern Appalachia, where coal is king. Both her grandfathers were coal miners and both died before she was born. Put away your fishnets and break out your weights — it’s the new era of roller derby. There are still about 10 minutes until the match starts, but the noise from the sellout crowd inside the Oakland Convention Center has reached a dull roar. As the anticipation builds, referees in zebra-striped shirts amble around the track, making sure everything’s up to regulation standards. Groups of tattooed 20- and 30-somethings make their way to the concession stands for tequila shots, beer and tamales; one biker couple in their 60s scopes out the bleachers for any remaining seats. Across the way, a group of first-graders unfurls a finger-painted banner they’ve made to cheer on their favorite athlete: their teacher. What: By night, Menace (Petrini’s alter ego) skates as a blocker for the Richmond Wrecking Belles team in the B.ay A.rea D.erby Girls league. Single, without children, she also volunteers her time as manager of public relations for the league. By day, she works in public relations for a film studio in Berkeley. When: Bouts take place between January and August, or longer if the Wrecking Belles go to the championships. Besides practicing on skates four times a week, Menace also runs Lake Merritt, climbs the Cleveland Cascade steps, does speed work on a high school track and manages to work in strength training, too. Energy as tangible as an electric current charged through the Craneway Pavillion on Saturday night as people flowed into the glass-lined room by the bay. The cavernous space was converted into a derby stadium for the 2012 B.ay A.rea D.erby (B.A.D.) Girls Championship showdown between the San Francisco ShEvil Dead and the Richmond Wrecking Belles.